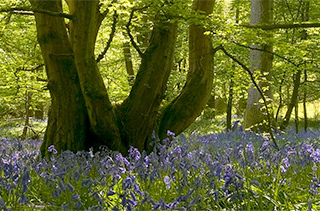 The West Weald Landscape Project is a project about joining up the countryside and making connections between core areas like nature reserves so wildlife can move more freely and does not become isolated in fragmented woodlands, meadows or wetlands. The West Weald is characterised by broad, low lying and gently undulating clay vales underlying an intimate landscape of ancient woodlands, meadows and pastures, intersected by hedgerows, streams and ponds. This landscape is akin to a historic forest landscape. Many rare species live here, including dormouse, fifteen of the UK’s eighteen species of bats and threatened butterflies such as wood white and pearl-bordered fritillary. This area was the first of the Sussex Wildlife Trust’s ‘Living Landscapes’ and is at the forefront of wildlife conservation in the UK through its landscape-scale approach to wildlife conservation. With so many threats to our Sussex Wildlife, from climate change and invasion by non-native pests and disease to loss of habitat to housing and road developments, such a landscape approach leads to a more robust and resilient Sussex wildlife. In the first phase of the project, 2009 to 2014, Sussex Wildlife Trust led an active partnership of conservation charities, government organisations, and local authorities. During this time we advised more than 130 landowners on land management for wildlife; helped many of them into agri-environment grant schemes and grant-funded 30 capital works projects, for example, hedgerow planting and orchard restoration. We also carried out many wildlife surveys, the results of which enabled us to offer more targeted advice to landowners. The surveys have provided a baseline against which we can monitor wildlife improvements over time. Building on these early achievements, the project continues today as a model for Living Landscapes, with landscape connectivity through landowner advice at its core.